It is with the deepest regret that we have received a report from Kōbe of the sudden and unexpected passing in mid-September of our very good friend over many years. 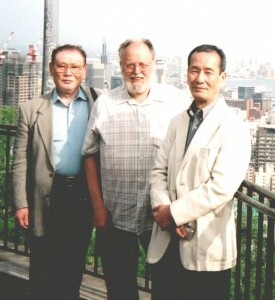 Inoue-sensei, whose command of English was excellent, had been a great help to us in many ways over the best part of the last twenty or more years. He was the chief point of reference in arranging on our behalf the technical side of a number of visits by our members and direct contact with various sensei within the Hyōgo Kendō Renmei. 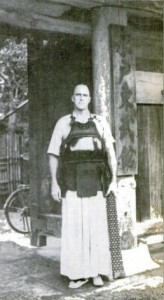 It was he, who as leader of the Kōbe International Kendō Club, arranged the excellent two-month long training in Kōbe for Thomas Bowen, sandan, from the Butokukan. Several members will remember with gratitude and pleasure their practises with Inoue-sensei and members of his dōjō and Ōzaki-sensei’s Isshinkan Kendō Dōjō. Both Pat and Roald Knutsen had many long and frequently humorous telephone conversations with him and were deeply grateful for his support and many kindnesses. It is with deep regret that we must mark the passing of Dr Gordon Warner who died on the 4th March, 2010 at the great age of ninety-seven. Gordon Warner was one of the very first foreigners to train in Kendō whilst living in Southern California, studying under the great Mori Teraō, Hachidan Kyoshi, as far back as 1937, He also trained at the famous Noda Dōjō in Tokyo until just before the outbreak of the Pacific War, leaving Japan in 1939. In 1943 he was severely wounded at Bougainville when the tank he was in was hit by Japanese fire, shattering his left leg (which he subsequently lost). At that time he already held sandan rank although for the remainder of his long Kendo and Iai-dō career he always held that rank was of no importance to any student other, possibly, to give some indication of progress. He, together with Ben Hazard, founded the Berkeley Dōjō at the University of California, still flourishing to-day. I first met Warner-sensei on my initial visit to Japan in 1967 through the introduction of Benjamin Hazard, Nanadan Kyoshi, and Donn Draeger-sensei. It was an introduction that I shall never forget. I was kneeling seiza at the side of the great Tokyo Budōkan, putting on my bōgu as I recall, when I became aware of a deep voice far above me saying my name. I looked up, first at white hakama-covered knees, then up to the chest, by now craning back my neck, and at the very top under a canopy of white hair, was Warner-sensei – all something like two full meters tall! At this point a beaming Hazard-sensei introduced me! I recall Draeger-sensei coming up at this point – and he was not far shy of two meters, himself – but here looking considerably shorter than Warner! The conversation that followed still is within my memory. The occasion was the happy World Goodwill Kendō Taikai (which eventually led to the first World Kendō Taikai in 1970 – a very different affair, unfortunately). In the individual matches at the Budōkan Warner- by now rokudan, faced a young Japanese sandan. With his great height and upright stance because of his artificial leg, Warner took his usual hidari-jōdan, towering over his diminutive and slim opponent. After some fast footwork the Japanese lad threw caution to the winds and attacked hidari-kote – and struck beautifully. There was a stunned silence for a second or two then the whole audience and the assembled Kendoka came to their feet to applaud – (no shouting, just applause that was well deserved). Warner-sensei lowered his shinai and bowed, too, in appreciation. I think that lad, now around sixty-five or so, has never forgotten! Just think that he achieved this remarkable feat in front of the Crown Prince, now Emperor! He lost, of course, but who cares? Gordon Warner was the first non-Japanese to attain nanadan in Kendo and held the rank of rokudan in Iai-dō – ōmori-ryū I think. I met him again in 1970 and briefly in 1975, but also kept up an occasional correspondence. After that he remained in Okinawa as Minister of Education. It is worthwhile noting that Dr Warner married a Japanese lady who was the grand-daughter of the famous Satsuma-han patriot, Saigō Takamori, who, in an oft-remembered final battle of the 1877 civil war, committed seppuku in a cave in Kyūshū along with a number of his followers. Mrs Warner came from a very high-ranking family, indeed.